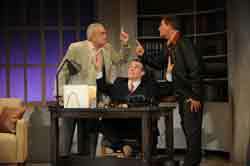 Photo by Kirsten Shultz From left, Scott Creighton as Ben Hecht, Ed Kershen as David O. Selznick and Victor Fleming as Andrew Alburger performing in “Moonlight and Magnolias” at the Liberty Theatre in Hailey. In 1939, Hollywood captured the attention of America and beyond with big films starring glamorous actresses and virile actors. However, there was one studio producer who was having some issues with his film and shut down the production to write a better script. The film was "Gone With the Wind." The film's producer, David O. Selznick, locked himself, screenwriter Ben Hecht and director Victor Fleming in an office to perfect the script. At the time, Fleming was directing "The Wizard of Oz." The five days that followed Selznick's lock-in are captured in Don Hutchinson's play "Moonlight and Magnolias." Hutchinson includes the hilarious moments, brilliant ideas and frustrations of these men who wrote a script for a film that became a Hollywood legend. "It turned into a farcical event," said Gordon Reinhart, who is directing "Moonlight and Magnolias" for the Company of Fools. "It's very interesting background in the making of the film." Several Company of Fools actors are performing, including Andrew Alburger as Victor Fleming, Scott Creighton as Ben Hecht, Ed Kershen as David O. Selznick and Christine Leslie as Miss Popenghul. "The play is about the relationship between these three men," Reinhart said. "It's about their souls and how things are perceived." Reinhart is from Boise where he is a professor of directing and acting at Boise State University. His credits are a list of theater festivals and productions that span the U.S.
"These are three idealists working in Hollywood," Creighton said. "They are real people." Not many people know this story, said Kershen, who is visiting the valley from New York City to perform at the Liberty Theatre for the Company Fools. Kershan is a notable actor who audience members might know because his career includes a long list of off-Broadway theater, television, film, commercials and voiceovers. "Moonlight and Magnolias" is family fun with witty dialogue and hilarious situations. It's also an eye-opening experience into learning about the creative process behind movie making. "Some of the comedy is dependent on the audience knowing 'Gone with the Wind,'" Reinhart said. "It's fun to see the struggle and how these guys got through." Tickets are $28 for adults, $20 for seniors and $18 for students. This evening, Dec. 15, and Thursday, Dec. 16, at 7 p.m. are Educator Nights, when tickets are $10 for teachers, and Friday, Dec. 17, is Girls' Night Out at 8 p.m., when groups of women get $18 tickets and other goodies. For tickets call, 578-9122 or visit www.companyoffools.org.